Normally when one talks about grinding around the Detroit area people usually think of The Grind Line of the Red Wings. 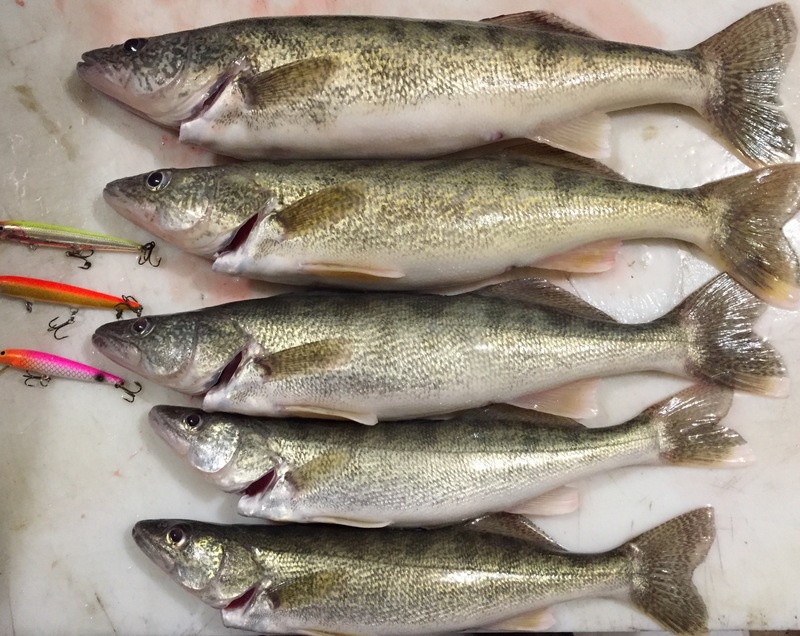 This time though it is all about walleye fishing on a long Good Friday evening. This last Friday (4/14) I was headed back out once again. This would be my fourth trip out for the week and I was hoping it would be as successful as the previous ones. I started around 6:30 pm and found that the water still had a heavy stain to it. I could barely see my prop, which was an improvement, but still a long way from clear water. I was hoping I could get my limit before dark but it didn’t take long to realize I was going to have to grind this one out. The water was choppy and there was a lot of boat traffic ripping up and down the river, which only added to the rough water. Boat control was difficult and I was constantly lifting my lines up to keep from getting snagged as I was bounced around. My wish was a double edged sword. I was hoping sunset would come soon to get these boats off the water and calm it down. Once it did though I wondered how well the fish would bite with the cloudy water. I soon found out, sort of. I didn’t catch my first fish until after 7:30 pm and it was an undersized fish. My first keeper didn’t come until around 8 and for the next two hours I slowly picked away at them. They never came hot and heavy and during the next two hours I tried everything I could think of. Different colors, different lures, different sizes, different speeds, different areas. Nothing really zeroed in on them. I got my limit but the fish came from different areas on different lures at different speeds. No rhyme or reason to it. The only consistent thing was their inconsistency. Persistence was the key tonight. Good thing I didn’t have anywhere special to go. Now for my rant. I would like to know who thinks it is a good idea to jig with 30 pound spiderwire or fireline? If you are afraid of losing a dollar jig then fish someplace else. Trying to save one jig and losing 50 yards of line (expensive line) only creates something for everyone else to get snagged up on. In other words, KNOCK IT OFF!! 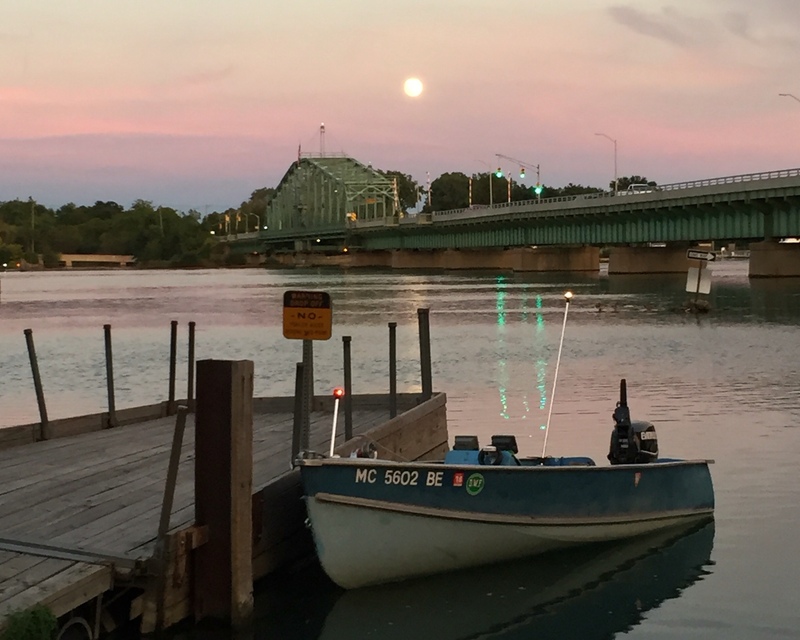 October is usually the start of some fantastic Fall fishing on the lower Detroit River. 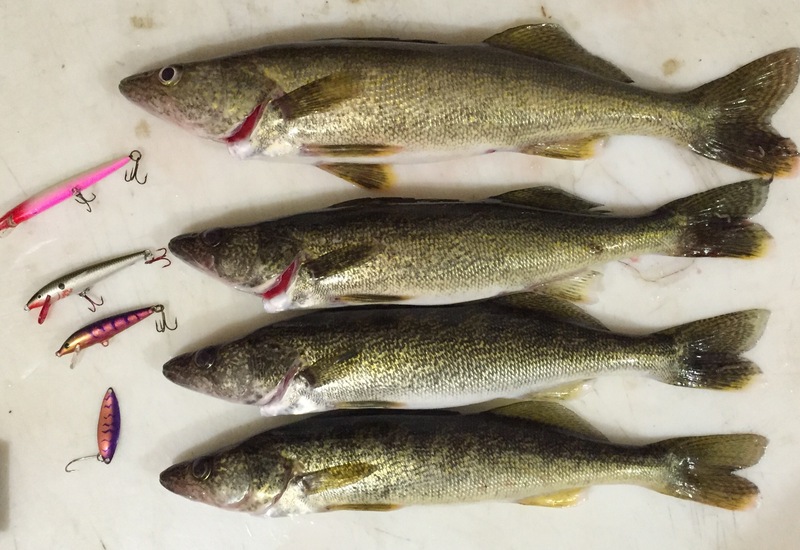 Bigger walleye move back in, chasing the gizzard shad to fatten up for winter. This year though, the timing is just a tad bit off because of the hot summer we had. Everything is running a little later than normal. I had debated waiting a few more weeks but when I heard that fellow handliners, Dave and Larry, were going to be out I decided to give it a shot. Safety in numbers and we could cover more water to help us key in on the active fish. Great theory, to bad it didn’t work. I arrived at the ramp just after 7 p.m. and the few pleasure boaters that were out were on their way back in. As I got my boat ready I noticed that the marina was full of weeds. I did not want to see that. I was hoping it was just the Marina but as I was heading south I could see mats of weeds everywhere. This was not going to be fun. I set up in my usual area and sent a text to Dave and Larry. They were farther south, down by Calf Island, so I just stayed up closer to the stacks. If either of us started to catch fish we would let the other know. About 5 minutes in I had my first walleye. As I was flipping him in he came off the lure and slid down the edge of the boat until he hit my reel. Once he did he fell right back into the river. For the next hour it was mostly clear weeds off the lines. Shortly after 8 I did manage to catch a 19 incher. About 10 minutes later I caught a short. I was starting to get a little optimistic but those feelings were quickly crushed when I hit a huge mat of weeds. After spending the next minutes clearing them off my lines and off my prop I was back at it. By now it was 8:30 and I told myself I would stick it out until 9. At 8:55 I landed one more that was just over 15 niches. A couple of minutes later and a quick text to Dave and Larry and I was headed home. The weeds were just to much to handle. If the fishing had been better I would have stuck it out but this was one of those nights when it just wasn’t worth the effort. Living only 10 minutes away makes these judgement calls a whole lot easier. The big one grabbed the size 7 and the little one grabbed the size 11. Go Figure. Moon over the Grosse Isle bridge. 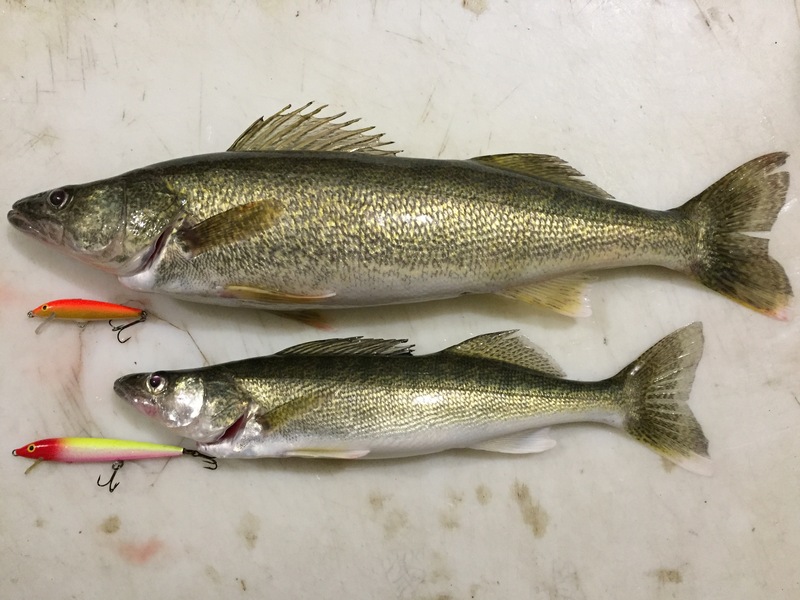 It’s no secret that I like to fish for walleye during the full moon periods. Normally I do pretty well but after the last two full moons I’m beginning to wonder. The Sturgeon Moon was less than stellar and The Harvest Moon turned out to be even worse. Hopefully the Hunter’s Moon in October will break the trend. I arrived at the ramp around 8:30 pm and I had the whole place to myself. No other cars in the lot, not even the ones normally parked over by the Marina. I launched and headed south to my usual starting spot. The water was still clear and a surface temp of around 65 degrees. A few weeds were floating down, mostly single strands with the occasional large mat. The south wind had died down to almost nothing which kept the water relatively calm. Seemed like the start of a good night. 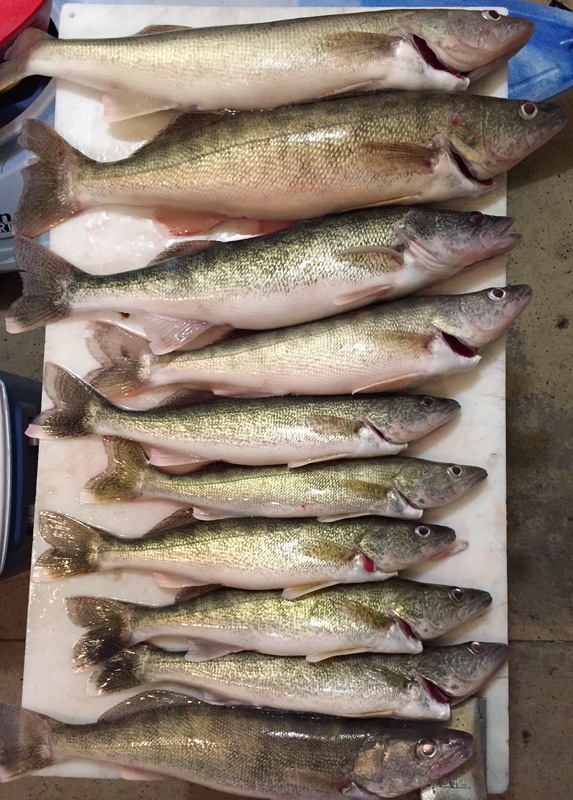 To bad the walleye had other plans. I trolled around for the next two hours and all I had to show for my efforts was a half a dozen smallmouth and a few sub-legal walleye. I tried different size lures, different colors, spoons, pencil plugs, just about every thing I could think of but I couldn’t get anything going. Around 10:00 pm I got hung up bad and after 10 minutes of trying to free the weight the shank snapped right at the loop. I lost the shank, weight and 3 custom painted Rapala’s. I thought about giving up right then but I hadn’t been skunked in almost 3 years and I wasn’t about to let it happen tonight. I dug out another shank, weight, leaders and lures and started all over again, after I moved away from where I got hung up. About 15 minutes later I finally caught a legal fish. Not much of one but it was a start. I tossed him in the cooler and headed towards the Edison discharge. I hadn’t been by there lately so I thought I would give it a shot. Weeds were a lot worse there and I could feel them starting to pile up on my line. Just as I was about to pull my lines and clear the weeds I felt a lot of weight. I figured I hit a big mat of weeds, under the surface, so I started to pull it all up. The “weeds” were all on my 40 foot leader so once I got my other two lines clear and out of the way I started to bring it in. About half way in the load became lighter and I figured some of them must have come off. I looked back and my headlamp showed a pair of eyes staring back at me. That stupid fish never shook once, she just came in like a wet towel. It was a bigger fish so I wasn’t taking any chances. I got my net behind her and just as I start to scoop she shook and threw the lure. Didn’t matter, she was in the net and then in the cooler. After that I decided to call it a night. I was headed to Columbus Ohio in the morning and I needed some rest. I had enough fish to fill a vacuum seal bag and I didn’t get skunked. It did turn out to be my most expensive trip of the year but I won’t lose any sleep over it. It was my own fault for not swapping out shanks and leaders. I had been using the same one all season so I’m sure it had been stressed in a few places. One of these days I will start to listen to my own advice. NE winds and clear blue skies. Seems like a perfect night to go fishing. It had been a couple of weeks since my last trip and I was feeling the need to go fishing. I at least waited until dark. I arrived at the ramp at 8:30 pm and was lines down at 8:45 pm. I was happy to see that there weren’t and big mats of weeds. I feared it might be bad considering there were NE winds all day. I started off with a pair of Downriver Tackle Custom Lures, a #11 Rapala in Pink Lemonade and a #9 Rapala in the Spring Valley Special II pattern. I also had a #9 Original Rapala along for the ride since that was it all it did. Just swim, not a single hit on it, not even a bass. About 9:00 pm I had my first fish and by 10:45 I had my fifth keeper. 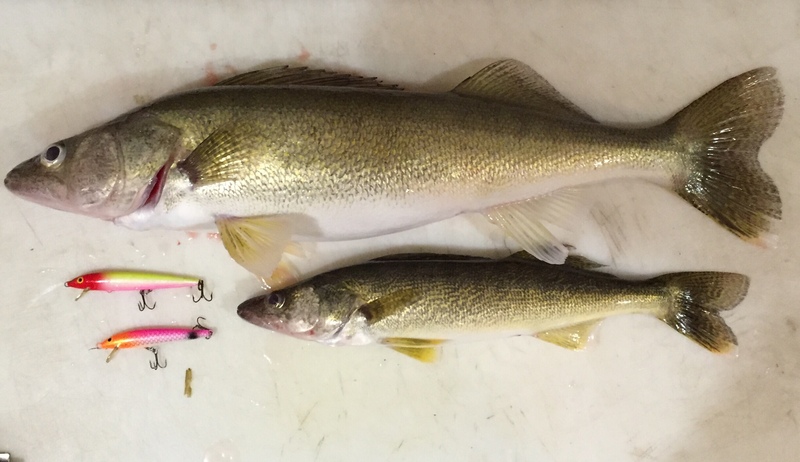 I also caught a few 8 to 10 inch walleye and all 3 hit the number #11 Rapala. Clear proof that their eyes were bigger than their stomachs. Only caught a couple of bass as well. It was a pretty peaceful and uneventful night except for about 5 minutes. Around 10:00 pm I got hung up, or so I thought. 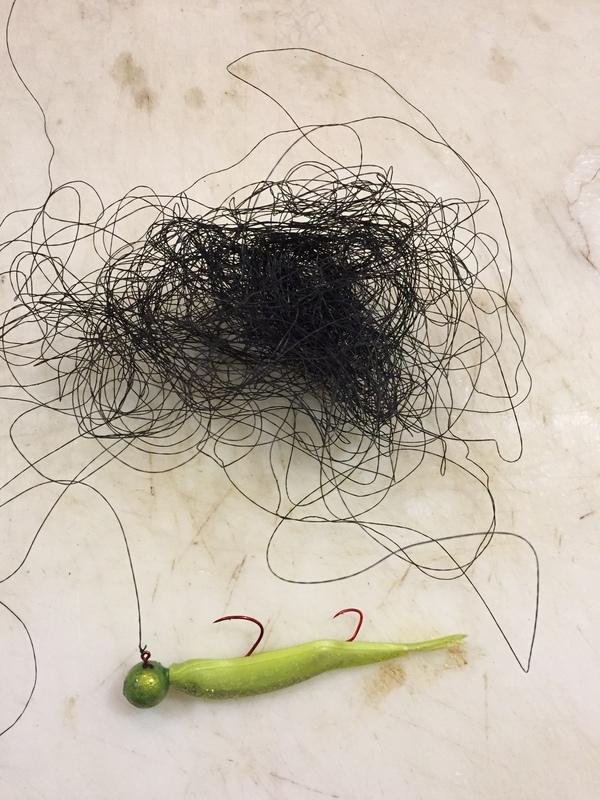 I felt one of my lures get tangled up in what I thought was a bunch of fishing line. I could feel it give just a little but I knew it was going to take some time. I started to circle downstream and gain wire back into the reel. Eventually I got close and was able to get my hand on the shank. My 40 foot lead was the one that was snagged so I got the two shorter ones in first. I started to pull on the longer leader and I could feel a tremendous amount of weight on it. I slowly began to pull it in when all of a sudden it started to shake. Turns out I wasn’t snagged on some old line, I was snagged onto a fish. There wasn’t a lot of headshakes, just a lot of dead weight. I thought for sure I snagged a sturgeon but it turns out I hooked a big channel cat in the head. He was coming in upside down, thus all the weight and lack of movement. I finally got him to the boat and removed the lure so I could send him on his way. He was well over 30 inches and probably quite relieved to be sent on his way, minus the lure in his head. After that not much happened. I caught number 5 at 10:45 and packed it in shortly after that. 5 more for the freezer and no damage or lost lures. Hope this continues for the rest of the year. Just need the temperature to start dropping. Then it will be walleye during the week and steelhead on the weekend. One thing that I did notice to night was that the fish were up off the bottom and moving around. The first two fish I caught was while I was brining in my leaders to check for weeds. The last two came on my kicker after I shortened up the lead from 7 to 4 feet. Just goes to show that they aren’t always hugging the rocks. You can file this one under useless Cliff Clavin bar trivia. I didn’t know this until recently but every full moon has a name. This past full moon is known as a Sturgeon Moon. What that actually means is still a mystery to me but it makes for a unique blog post title. I started out fishing Friday night a little earlier than I normally do. It was overcast so I figured going before sunset wouldn’t hurt. Of course, once I got on the water the clouds broke and the sun came out. Oh well, live and learn. At least there were no weeds, for now. I started it my usual area and threw out a few spoons and a #9 Bleeding Olive Rapala. Not much happened at first but around 8:00 pm fishing got interesting. Bass, Bass, Bass, Bass, Bass, Bass, Are You kidding me? Bass, Bass, Bass, Bass, Bass, Bass, swap out spoon catching all the bass. Brief lull. Short, Short, legal, Double Legal, Short, Short, Legal, Bass, Double Short, Really short, Lost at boat, Short, Bounced off side of boat, Short, Rocky, Short, Short, Short………………………………………………………………….Short, Ridiculously short, Where did all the weeds come from? Screw this. Went home. That’s pretty much how the evening went. From 8 to 9:30 my lines were out of the water more than they were in. 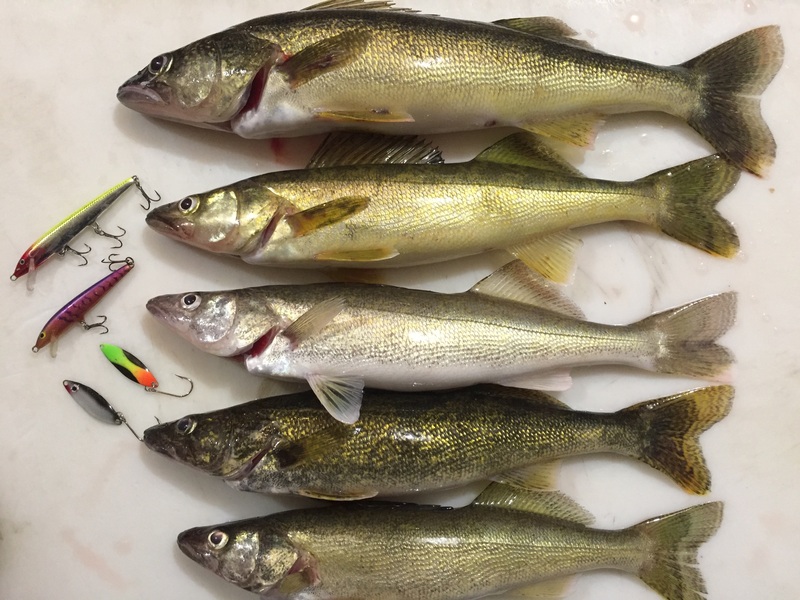 Smallmouth bass and lots of undersized walleye. Once the full moon came up and cleared the trees the fishing really slowed down. Kind of odd since I usually do pretty well under a full moon. Just goes to show that there are no absolutes in fishing. Around 10 the weeds showed up in force and fishing became impossible. I tried to find clean water but it just wasn’t happening. Eventually I gave up and headed in, there will be other nights. 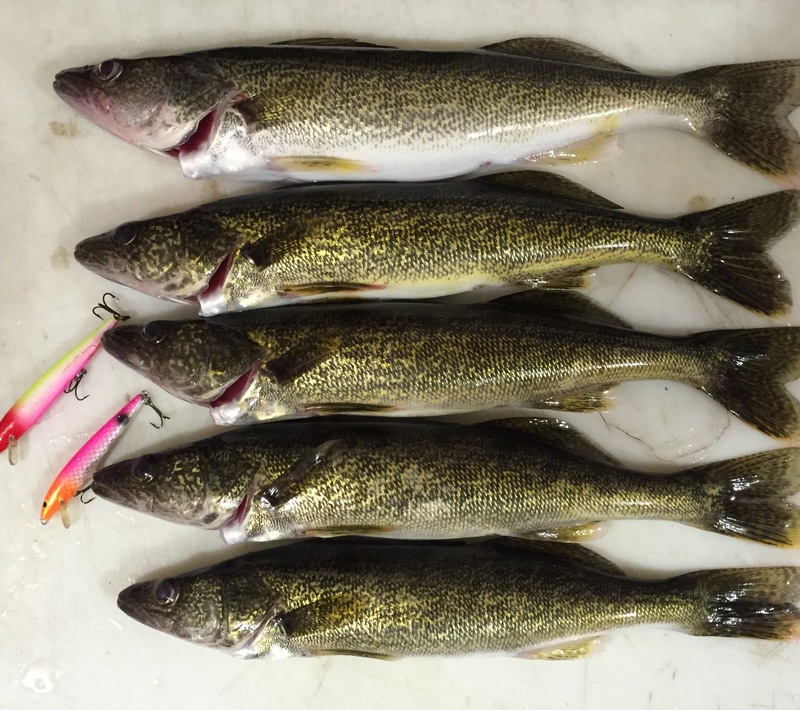 At least I know, barring some catastrophic event, the walleye fishing next year should be awesome.